It appears that CNN’s “Michelle mania” has reached a new level. After referring to the Obamas as the “royal family of the United States” on April 1, the network conducted a web “quick vote” on Monday on whether the first lady should run for her husband’s position in 2020. 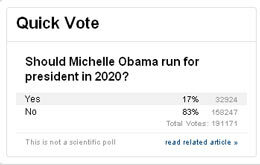 The results, however, did not bode well for “mighty Michelle,” as one guest on CNN labeled Mrs. Obama. Before the poll was taken down, 83% were opposed to the idea, while 17% were in favor. As the graphic states plainly, it is not a scientific poll. As much as this “Michelle mania” is apparently running rampant abroad, as the network would lead you to believe from these reports, these results may mean that “America’s unofficial royalty” have some obstacles to overcome before any political dynasty could become a reality.